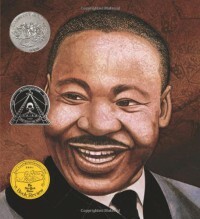 Martin's Big Words: The Life of Martin Luther King Jr.
Martin's Big Words: The Life of Martin Luther King Jr. by Doreen Rappaport is a great rendition of the history of Dr. Martin Luther King Jr. This book does an excellent job of explaining historical events and facts of the Civil Rights Movement and Dr. King's influence during that time. This book is appropriate for young readers and uses developmentally appropriate language. The illustrations are exceptional. Without too many words and with just enough detail, readers can learn about the life and death of Dr. King as well as the start and end of the Civil Rights Movement. This book serves a great educational purpose in the classroom. After a lesson on Dr. King's influence during the Civil Rights Movement, I would read this book to the class and discuss it afterwards. Then I would ask students to read portions of the famous "I Have a Dream Speech" by Dr. King and to find real word examples of how his dream came true. Then, I would ask students to help write a class "We Have a Dream Too" speech where we would write dreams or wishes we have for the world as it is today (and the issues Americans face today).